Monin Apricot syrup in stylish 70cl glass bottle. Apricot is a fruit-bearing tree, native to China, imported into Europe by the Romans. The fruit appears similar to a peach or nectarine, with a colour ranging from yellow to orange and sometimes with a red cast. Juicy and soft apricots are high in natural sugars. 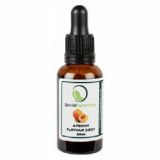 The delicious taste of apricot may be blended with a very wide range of flavours. So try Monin Apricot and discover its many possibilities! Colour: Slightly cloudy light orange. Taste: Apricot jam smell with notes of core; sweet apricot jam taste with a hint of acidity. Sugar, water, concentrated apricot and other fruit juice, flavouring, acidifying agent: citric acid, colouring agents: E163, E102. Total apricot juice : 12% minimum. Please note: Not compatible with steamed milk, coffee or chocolate based drinks.